There are various federal and state programs available in Washington to help workers train for new careers. 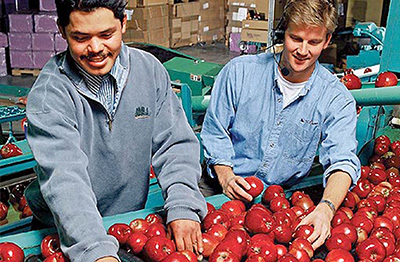 Click on the following links to learn more about available training programs for farm workers and their families. The Washington State Employment Security Department helps people succeed throughout their working lives. We support workers during times of unemployment, track and analyze labor market trends, and link businesses and job seekers to a diverse range of employment services provided by the state’s WorkSource system. OIC manages and operates a program that provides employment-related services to eligible workers and their families in Washington. The purpose of the Adult Program is to help workers stay employed, earn more money and improve their job skills. This program aims to improve the quality of the work force, reduce welfare dependency, and enhance the productivity and competitiveness of the nation's economy. There is a priority for eligible low-income and welfare recipients and for certain veterans or veteran spouses to receive specific services. The program provides a range of self-service and staff-assisted services for adults seeking employment. WIOA youth programs provide a wide variety of services that help low-income young people (ages 14-21) to succeed in school and work. Program participants may receive services such as occupational skills training, counseling, internships, job placements, mentoring, tutoring, leadership development and support services. The Farmworker's Program classes are designed to help agricultural farm workers upgrade their skills and enable them to take advantage of available employment opportunities. Classes are offered in basic automotive maintenance, computer literacy, welding and English. These classes are taught bilingually (Spanish/English). The College Assistance Migrant Program (CAMP) assists students who are migratory or seasonal farm workers (or children of such workers) enrolled in their first year of college undergraduate studies. The funding supports completion of the first year of studies. Competitive five-year grants for CAMP projects are made to colleges or to nonprofit private agencies that cooperate with such institutions. The program serves approximately 2,400 CAMP participants annually. The following universities in Washington operate and manage the CAMP program. English classes are offered through various community colleges, school districts and community-based organizations. The following community colleges offer ESL classes.